We have been going through the Gospel of Luke. This is the passage went through on Sunday last September 4, 2011. Luke paints a picture contrasting two responses to Jesus and to the presence of the Kingdom of God. We are meeting in a new place! This is a link to the google map location of where we will be having our Worship service this Sunday October 2, 2011. The name of the restaurant is Allan’s Grill, we are at the upper level. It is in the Cubao X, which used to be the Marikina Shoe Expo. It is in Cubao commercial complex. I think it is near the Ali Mall. See you guys there. Please visit us. Our service starts at 10am until 12nn. Come and encounter the Father and be refreshed. Come to just hang out or if you want to receive prayer for healing or other concerns as well. 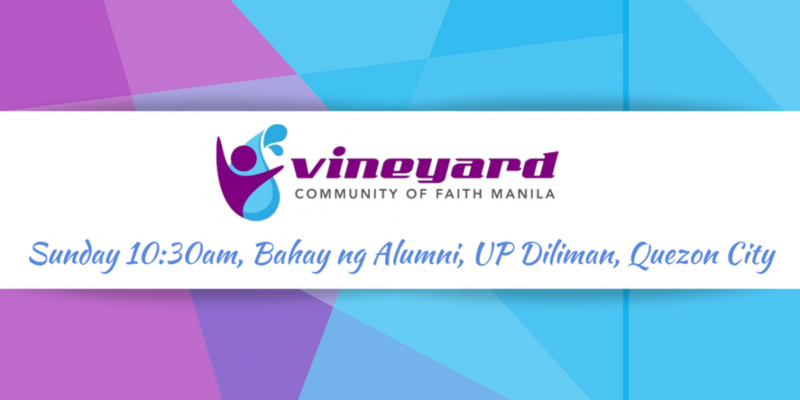 This is a short post to let everyone know that Vineyard Community of Faith Manila is looking for a new location to move to. The contract with the current venue is about to end. We feel that at this time the Lord would have us move to another location. We would like to ask for your help and support by informing us if you have, or know of a place that would be ideal for the church to move into. There have been very comforting words we have received from the Lord, indicating that He is going to do some new things through and with the community of faith in Vineyard Manila. Some of the ideas that have gone out are moving to Makati City, and staying in Quezon City. Will give you all a heads up as plans develop. Thank you and Abba bless you and keep you. Don't forget this coming sunday its Potluck lunch! We'll be sharing food and fellowshiping together after the main worship service! If you would like to bring your favorite dish to share you are Welcome to do so. However please don't feel under any pressure to bring anything, we'd simply love to spend time with you. See you on sunday! Over the Month of February we had two special youth fellowships. One for our junior youth of high school age and another for our youth of college age. We had some fun Valentine's themed games and some discussions and teaching on love. Hello everyone! This Sunday, Feb. 10, we will meet in the Filinvest 1 Multi-purpose Hall at 10:30.Followed by potluck lunch fellowship. We hope to see you there as we continue our series in blessing. If you need any more details or directions to this weeks venue please do my hesitate to get in touch.